We are moving toward developing a native American cultural center and have made progress. From Council members in Hot Springs and abroad, Thank you all for contributing and the many promises to volunteer labor to make it reality. The holiday we call Christmas has evolved into the biggest celebration in the world. Roman Catholics and Protestants celebrate the birth of Jesus on December 25. Many Orthodox Christians use the Julian calendar, which places Christmas around January 6. The Creator gave each culture a path to God. To the Indian people, he revealed that the Creator is in everything. Everything is alive with the Spirit of God. The water is alive. The trees are alive. The woods are alive. The mountains are alive. The wind is alive. The Great Spirit's breath is in everything and that's why it's alive. All of nature is our church, we eat with our families in church, we go to sleep in church. My Creator, let us leave people to worship You in the way You have taught them. Copyright: Coyhis Publishing found in the book, Meditations with Native American Elders: Any republishing of part or all of their contents is prohibited. Many of the AmerIndian peoples have been Christianized for several hundred years. Over this time customs which were introduced to them by the missionaries have become adapted and are an integral part of the traditions, especially around the Christian festivals of Easter and Christmas. Many Tribes, including the Laguna Indians, who accepted Christianity some 400 years ago, have the custom of a dance on Christmas Eve, where gifts are offered at the Manger. There are many examples of representations of the Christmas Crib where the glad tidings are brought to braves in the fields by the great Thunderbird; or scenes with the wise men being replaced by the chiefs representing the great Nations. In this family photo, Joseph Medicine Crow wears a headdress beaded by his granddaughter and a war shirt from the Custer Battlefield Trading Post in Crow Agency, Montana. The Bighorn Mountains are in the background. CROW AGENCY, Mont. — The last Crow war chief entered the log-cabin trading post at the edge of the Little Bighorn Battlefield just after noon on a Sunday, supported by his son on his left and a cane held firmly in his right hand. Often, at tribal events such as powwows, he’ll swing his cane overhead in celebration. But on this October afternoon, with wind sweeping across the stretch of southern Montana that’s home to the Crows, the cane simply supported the centenarian — Dr. Joseph Medicine Crow in English or High Bird, his traditional name, in Crow. In turn, he’s made it his duty to document and share it. profitable resources. It's a small story... that we think is going to have a huge ending. Baths. Yesterday, Today and Tomorrow. The legend of the Quapaw Cave purportedly based on the tale of a man named Nathan Dale who claimed to have been born in 1833 on the site of the present Quapaw Bathhouse. It is probable that Dale is only a mythical figure. The name does not appear in any of the local federal censuses, including the earliest one taken in 1840. If Dale had existed, he would have been seven years old at that time and unlikely to be anywhere but at home when the census takers came through. The name never occurs in the sworn testimony on pioneer land use taken from early Hot Springs settlers in 1830s and 1840s, or in the 1884 Congressional hearings on the creek arch that included testimony on area history. The name is absent from the long lists of land claimants in 1875 and 1877. It is also missing from the extant city directories in the 1870s and 1880s. Even if Dale were an actual historic figure, his description of the site is grounded in myth, not fact. It was in fact an early bathhouse site. The Magnesia spring (renamed the Quapaw spring) pouring from the side of the creek had a stronger flow than most of the other springs, and even in 1833 it would have supported some sort of bathing facility. This is also the site where John C. Hale erected his bathhouse in 1854. It is thought to be the first real bathhouse on Hot Springs Creek. Mr. Dale described an area where Indians took thermal water and mud baths and a long passage winding back into the mountainside that had streams of hot water gushing from the walls. The Quapaw Indians have a tradition of bathing in the springs going back to the late 18th century, but the rest of the statement is not accurate. READ MORE.. Throughout the long history of the Iroquois there have been many women and men who have become heroes because of their courage, dedication and compassion for their people. Traditional Iroquois place a high value on community service, humility and generosity; they view with contempt those who devote their lives towards the accumulation of material things at the expense of these ancestral values. In this century few Iroquois sacrificed as much for the people as Levi General, a Cayuga man who lived as a farmer on the Six Nations Grand River territory west of Hamilton, Ontario. General was a noted linguist among the people of the Grand, speaking not only his native language but the other five dialects of the Iroquois as well as English. He was born in 1872 and labored for some time as a lumberjack before turning to the land. There is something about Christmas that makes our hearts skip a beat and hold still for a second. It is seen in the fascinated gaze of a little child’s eyes when they see their first Christmas tree lights. It is in the wonder of surprise at the sight of first snow on a winter day that brings me joy, sadness, and tears of hope. There is magic at this time of year all things just for one moment in time are possible. The door is open and all we need to do is step in and find our answer to eternal love, hope, and peace. I remember the time before Christmas and the anticipation a child can feel. Even when we knew that there would be little under our brush pine tree we still held hope in our hearts. We made ornaments from walnuts shells and tin foil that we carefully saved from the gum and cigarette wrappers others threw away. We strung pop corn and filled hand made paper cones with pop corn and hung them from the branches. During the day we would eat the pop corn from the cones until it was all gone. There were five candy canes on the tree, one for each of us that would be given out on Christmas day. A tin star cut from a coffee can lid, sadly bent and tarnished, topped the tree. These few hand made ornaments along with some old and carefully hung glass balls completed our decoration. READ MORE..
Scott Sutton's latest craftbook expands on the knowledge and skills presented in his first book, Beadwork Techniques of the Native Americans. This volume presents eight new beadwork projects in which Scott includes personal, little-known tips that he has developed from his extensive experience. Each lesson has easy to follow step-by-step instructions that are accompanied by full-color photographs and detailed illustrations. Projects include Medallions, Belt Buckles, Barrettes, Loom Beaded Belts, Scalp Feathers, Flat Fans, Moccasins, and Small Dance Bags. Each section includes information on selection of materials, tools, and necessary supplies. The Big Pine Paiute Tribe of the Owens Valley is located on the Big Pine Indian Reservation in California, at the foot of the Eastern Sierra Nevada Mountains. The tribe’s early ancestors utilized the land and water to create irrigated areas that produced the tribe’s main food source. However, at the turn of the twentieth century, the city of Los Angeles purchased most of the land and water rights in the Owens Valley and transferred them to the Los Angeles basin, thus severing the tribe’s connection with the land and water and interfering with its ability to feed its own people. Today, the Big Pine Reservation is considered a “food desert” because of the lack of access to healthy and affordable food. In 2010, the tribe established the Sustainable Food System Development Project to transform its food desert into a more robust, sustainable food system by establishing a permaculture garden. In 2013, First Nations awarded the Big Pine Paiute Tribe $37,500 through the Native Agriculture and Food Sovereignty Initiative (NAFSI) to expand the permaculture garden to include a demonstration site, a fruit orchard, a seed bank, and a weekly farmers’ market. This grant, underwritten by the W.K. Kellogg Foundation, has allowed the tribe to develop an innovative field-to-fork model that will sustain the community for generations to come. 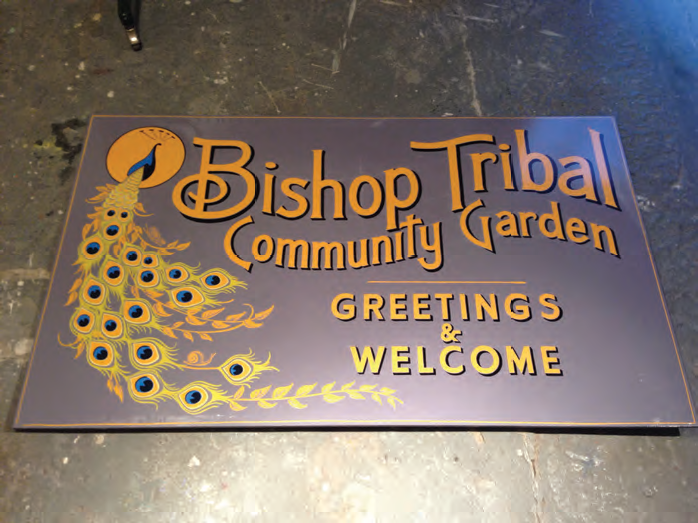 This grant allowed the tribe to expand their small permaculture garden into a larger educational community garden that teaches tribal members how to plant, grow and harvest healthy, organic heirloom fruits and vegetables as well as Native plants and medicine. 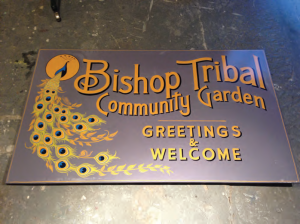 The tribe used the expanded permaculture garden as a demonstration site to conduct several classes and workshops, including a three-day intensive permaculture course, food policy/sovereignty classes, youth mentoring sessions, and numerous gardening workshops. The gardening workshops, in particular, have been very popular among tribal members. At these workshops, tribal members learn about composting, caring for plants and respecting ecosystems. Many workshop participants used these lessons to create their own personal home gardens. These workshops encouraged tribal members to start their own gardens while simultaneously attending to the community garden. 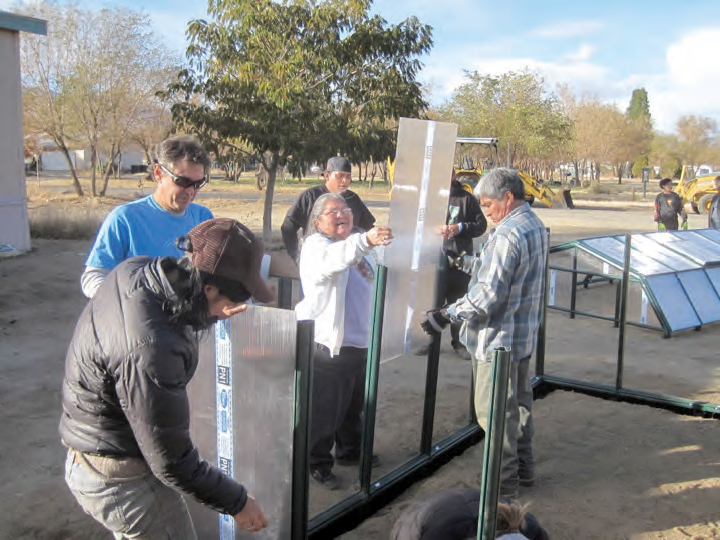 As a result of these hands-on workshops, tribal members helped plant, grow and harvest more than 100 pounds of squash, cucumbers, tomatoes, green beans and bell peppers that were eventually donated to the tribal grocery store. Many tribal members also volunteered at the expanded permaculture garden site outside of these workshops. For example, several volunteers helped plant 50 perennial fruit trees. The trees did not yield any fruit this season. However, once these trees mature, they have the potential to yield hundreds of pounds of fruit. These trees will produce healthy, fresh fruit for generations. The tribe speculates that eventually they will need to hire more workers to maintain the fruit orchard and the ever-expanding permaculture garden. The tribe determined which fruits and vegetables to plant in the permaculture garden by conducting a community survey. This survey also helped the tribe determine which seeds to collect and store for the seed bank. The purpose of the seed bank is to gather the seeds of plants originally grown in the region and preserve them for future generations. The seed bank is a continuing process that will grow as the tribe becomes more and more aware of its needs and learns proper seed-saving techniques. A portion of this grant was also used to host weekly farmers’ markets that helped farmers and workshop participants sell their fruits and vegetables. These farmers markets are intended to help growers earn extra money and provide tribal members with a healthy alternative to processed foods. 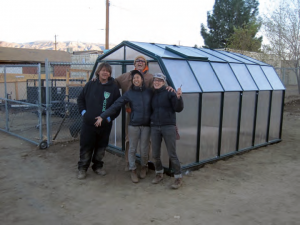 The Big Pine Paiute Tribe of the Owens Valley developed the Sustainable Food System Development Project to improve the physical health and well-being of their people and to preserve their tribal community for generations to come. The success of this innovative field-to-fork model reiterates that tribes have the potential to strengthen and improve their own communities. Inside every human being are the laws and codes by which we should live. These laws and codes are communicated to us through a little voice. When we are still, this voice guides us. If we choose to live out of harmony, our lives become filled with anger, hate, selfishness, dishonesty, etc... When these things appear in our lives, we give up accountability and blame it on something or someone else. If we want to live in harmony, we need to pray our way back to living the principles the Creator gave us. Grandfather, today let me walk with the principles. Please help Manataka Now! Over the past 20 years, we seldom asked for help. We need it now. Fund Raising Professional needed. Experienced and aggressive. Email us now. Education Committee needs Teachers, Educators, Cirriculum Developers. We are developing a new approach to teach values in public schools using American Indian philosophy and customs. Contact: Dr. Rev. Fred Wilcoxson. A First Nations woman in Northern Ontario faces thousands of dollars in fines and a stop-work order on the cabin she is attempting to build in the place where she grew up. Darlene Necan is a member of the Ojibways of Saugeen First Nation, but she's been unable to acquire housing in that community, about 400 kilometres northwest of Thunder Bay, since the reserve was created in the late 1990s. Take Pride in Your Tribe -- Fly It High! The Elders say the Native American women will lead the healing among the tribes. We need to especially pray for our women, and ask the Creator to bless them and give them strength. Inside them are the powers of love and strength given by the Moon and the Earth. When everyone else gives up, it is the women who sings the songs of strength. She is the backbone of the people. So, to our women we say, sing your songs of strength; pray for your special powers; keep our people strong; be respectful, gentle, and modest. Exciting line up of more than fifty guest speakers revealed for this year’s World Indigenous Health Conference in Cairns Queensland Australia on 15th – 17th December 2014 at Pullman Cairns International Hotel. What an exciting year for conferences with Australia playing hosts to two international Indigenous conferences which looks like an invasion by Indigenous Peoples from around the world rather than a meeting of the minds. The overwhelming response even surprised the event organizers as sixty (60%) of the fifty confirmed speakers at the World Indigenous Health Conference & World Domestic Violence Conference are coming from world class international First Nations’ backgrounds representing various countries worldwide. How Does the Earth Speak to Us?